Investigators are trying to determine whether the camera attached to the ski helmet of Formula One racing champ Michael Schumacher may have contributed to the helmet's failure when he crashed on a French ski slope last year. 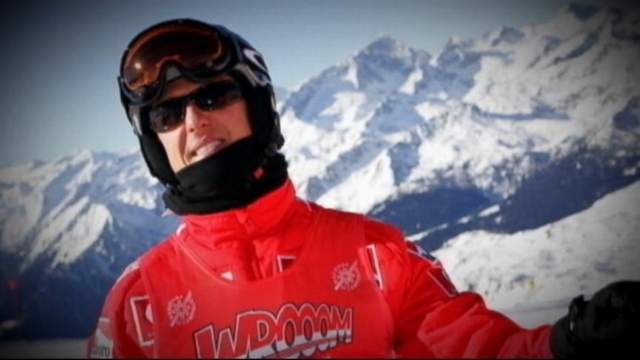 Schumacher, 45, has been in a medically-induced coma since December when he lost his balance at a French ski resort, slamming his head on a rock. French investigators have ruled out criminal wrongdoing in the accident, a state prosecutor said today. Albertville prosecutor Patrick Quincy said "no infraction by anyone has been turned up" and the probe has been closed, his office said in a statement. His statement appears to end any question about whether the Meribel ski station in the French Alps or an equipment maker might have had some role in Schumacher's injury. But according to The Daily Mirror, the French Ski Academy, ENSA, is investigating why his helmet shattered. New questions have emerged about whether the camera attached to the helmet somehow weakened the helmet. Dr. Farbod Asgarzadie, a neurosurgeon at Loma Linda University (Calif.) Medical Center, said the helmet could have been damaged by the installation of a camera. “If a hole were drilled into the helmet and that were the method for mounting a camera, then potentially it could cause a problem with the integrity of the helmet,” Asgarzadie said. Nowadays, everyone seems to have a helmet cam – not just extreme athletes. People use the cameras to record their athletic pursuits, including bicycling and climbing. Experts say the cameras may be encouraging people to take dangerous risks to get the perfect shot. More people are also wearing helmets, experts say. According to the National Ski Areas Association, about 70 percent of all skiers and snowboarders wore helmets during last year’s ski season, a new record. “If you have a substantial impact straight on with a fixed object, it’s probably not going to save your life,” said Brendan Irving, the ski patrol supervisor at Winter Park Resort in Colorado. In Schumacher’s case, the racing legend, 45, suffered serious head injuries on Dec. 29 when he fell and hit the right side of his head on a rock. Schumacher has been treated at Grenoble University Hospital in southeastern France since then.